I’ve been having intentional out of body experiences and practicing astral projection since 2013. Ever since I had my first experience by accident, I had become obsessed with trying to recreate the experience learn all about it. I read everything I could get my hands on. I watched countless tutorials and tried all sorts of different techniques and even attended a 5 Day Out of Body Exploration Intensive at the Monroe Institute. It took me weeks of daily practice to finally have one intentionally. It was amazing, exhilarating, and totally mind-blowing. I didn’t know such a thing was possible! Listen to my interview on the Glimpse of Brilliance podcast. How do you have an Astral Projection? Let me first say something really important. It’s not necessarily the technique, it’s more about your mindset and effort. 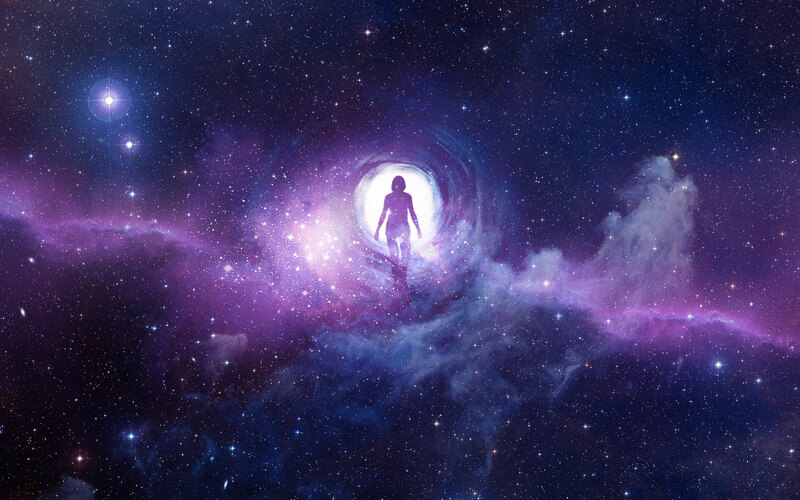 To have an astral projection you must first have an open mind. Be open to the possibility of their being more to reality than what you experience with your five senses. The second thing is effort and practice. If you put in time every single day to thinking about, learning about, and practicing, you’ll be more likely to experience something. Many people try haphazardly and give up and say it doesn’t work. Some people try for weeks and months and years off and on and still never had one. I can’t explain why it comes easy to some people and harder to others. See also: Am I a Starseed? Robert Monroe! I have to recommend Robert’s trilogy of books. The first book is called Journeys Out of the Body. It’s old, but it’s a must read. He documents his discoveries after having a totally random OBE one night. He thought he was crazy, but what unfolded after was extraordinary! He went on to found the Monroe Institute which has been huge in research and education of consciousness. He’s no longer alive today, but his teachings live on! The Path Documentaries are brilliant. They are well produced documentaries interviewing many of the luminaries in the out of body exploration arena. They have so far released two films in their trilogy: Afterlife and Beyond the Physical. The makers of these films have created a new podcast too which is worth listening to. Charlie Morley is another wonderful writer and teacher from the lucid dreaming school of thought. His book Dreams of Awakening blends mindfulness and Buddhist teachings with lucid dreams. He doesn’t get into out of body or astral travel much, but I think it’s a brilliant perspective to keep in mind. He’s also a breakdancer like myself, so he’s a man after my own heart. World of Lucid Dreaming – I can’t leave out the work of Rebecca Turner. I haven’t explored much of her work, but she seems to put out great content all the time on the subjects. She’s a great writer and teacher and shares so much. I think she’s great. Robert Waggoner wrote one of my favorite books simply titled Lucid Dreaming: Gateway to the Inner Self. It was hugely relevant for me as someone who enjoys personal growth and discovery. He covered all sorts of topics related to consciousness and the metaphysical and provided some explanations and examples. It inspired me to look at my out of body experiences as opportunities to explore my deeper self. Stephen LaBerge is probably one of the most well known writers and educators in the lucid dreaming field. He’s got to be credited with making lucid dreaming mainstream. His knowledge, teachings, and techniques are helpful to anyone looking to explore consciousness. His book Exploring the World of Lucid Dreaming is widely considered a must-read. I admit, I only got halfway through because to be honest his book was kind of boring to me. Multidimensional Man – I remember watching videos of this guy and feeling inspired. I admit I haven’t explored his entire body of work, but he seems to have produced a ton of great content about consciousness, awareness, metaphysics, out of body and astral travel and all that. Good stuff! Teal Swan has been a big inspiration for me. She talks about a TON of interesting topics realted to spirituality, consciousness, and the human experience. She’s done videos about astral travel and out of body experiences that I think are worth checking out. Robert Bruce – A kind Redditor /u/Atmic pointed out I was missing material from Robert Bruce. According to Atmic: “He’s my favorite AP researcher/author — very pragmatic, non dogmatic approach based on empirical evidence. I’ve even paid to work with him during a weekend seminar. He has a lot of great work, but the seminal piece in my opinion is Astral Dynamics. That’s a link to the 10-year revised/updated version, but the original is just fine if you run across it. You can get a taste of his style. I’ve been dying to go back to talk to her. I have to try and focus more on having an OBE for sure. I’ve been distracted as of late with… life (lol). I’ll keep you posted if it happens!! Thanks for sharing your experience too! Sometimes the night terror happens when I’m sleeping and I wake up in it without knowing how it started. But sometimes I can witness it starting. And then it’s just about not fighting it, but surrendering to it knowing that you’re going to be ok. The more you fear, the more you see scary stuff. Try to wrap the whole scenario in love and acceptance. Thanks I’m glad to hear! Robert Monroe is the best! Hey Dude i was just wondering when i was going out of my body somthing happened while “Climbing the rope” my body started moving by itself i did nothing to move it i noticed it was moving and then i felt like i was flying backwards but i didn’t see a line that connects me to my body any idea of what happened? You won’t necessarily see a line or cord that connects you to your body. In my experience, I’ve never seen it, even when I’ve consciously looked for it. Don’t worry you won’t get lost or be unable to come back to your body. In most cases, just thinking about your body is enough to get you back in. What it sounds like to me is you were in the beginning stages of the OBE. That you successfully detached for a moment and were indeed out of body. Any sensations of movement or energy are good signs. Do you really think that your method will work? If you can really go out of your body then do not do it again. I tried last night for the 2nd time to have an obe. I entered sleep paralysis and freaked out. (I had forgotten this part) tonight I am going to try again. This time I will try to calm myself and hopefully have my first OBE. Its helpful knowing I can wake up whenever. Thank you for your advices,they sound real,i hope to have anObE soon! hey! I have some questions, can you walk through objects? Is it possible for you soul to die? (lets say you fall of a building or something like that while you are on your astral dream) How far can you travel? How do you return to your body? It’s understandable to feel fear or be worried. But it’s mostly because you just don’t know what it all means or what’s happening yet. Keep inching towards your fear, with a desire to see it and understand it. It could be something deep within your subconscious trying to come up to be healed. You’re close! When you feel yourself out of body like that, literally try to stand up and move. Or use a command “doorway now” – there’s a good chance you will move but it would be your astral body not your physical body. You’re very descriptive about what that was like. I don’t feel I’m qualified to give advice, but thank you for helping me understand what the feeling is! Yeah I often hear voices too, sometimes muffled, sometimes clean. They could be guides or helpers or other entities. Your consciousness is picking up different stations like a radio dial as you scrub through. I recently had a proper OBE astral projection experience after knowing about it. I have done it before by accident but thought it was just a lucid dream. I’m now trying to master it and replicate it too. I succeeded in doing it again a week after and will continue to practice it. But once I’m in I don’t know what to do. What do you do when you are in the astral world? have you tested to see if it affects our physical reality? Hi again Jeff. Sorry but i made a typing error above! Where i wrote ” then someone went back into my body and lived to tell my story.” it was meant to say SOMEHOW i went back into my body. NDEs are indeed OBEs! Often they are just much more intense as the physical body has receieved some massive trauma and your astral body has popped out or dissociated. You realize you are still conscious, still aware, even though your physical body may be “dead.” Crazy huh? Sounds like you had some really interesting experiences that are very meaningful! Yeah you can have spirit guides or soul family that feel familiar. They can be helpful and friendly and usually want to support you instead of trying to persuade you or control you. You have to be smart and use discernment like you do in your waking life. It’s hard for me to tell you that you are doing something dangerous because it is so personal and you are the authority on what feels safe to you. Follow your gut. Hi Gilbert, thanks for the invitation. I met William at the Monroe Institute in 2015 when I took his 5 day OBE workshop. Great guy. I joined the FB group and look forward to learning more about it. Dreams are really astral projections, it’s just about how much conscious awareness you are bringing to it. You were conscious and aware and sat up, but then you “woke up” and opened your eyes in the sleeping position. Does that mean what you just experienced didn’t actually happen? In my opinion, you were astral projecting, having an OBE, etc. And then it ended and you got back into your body. My suggestion when you feel the vibrations is to just let go and relax into them. Like you are floating in water. Let your self fall or float or whatever happens. Mr. Finley, please I need your help. I have been traveling but not on purpose. It seems to happen when someone I am close to needs me. Once I was able to touch my best friends cheek and she could feel it. This only happens when I am awake and I can’t control it. There is so much more to the story. Is there anyway that we could talk? My first OBE was about a year ago. It was very short but excuting. After that I practice and try diffrent methods but I havent had any success. My question is, after vibrational state, how do you know you are out of your body? Do you open your eyes? Do you move? Or you imagine you move your body? You should be able to “see” and it feels like your eyes are open. If you let go and sink down, you will start to separate – you can feel your self “moving” even though your physical body is still. Now from here, go ahead and try to move to the doorway or sit up or something. That’s good to hear! Yes, you can get as much clarity if not more than your regular waking state. If “clarity now” isn’t working, try rubbing your hands together or using some powerful intention to see more detail. You conviction or belief has a big effect on it. You definitely had an OBE! I have felt hands pull me out too and it is so very real! I would chalk this up as a victory and next time it happens you won’t be as anxious or excited and you can just surrender and let it happen. Keep calm, even during excited states, as it helps you stay lucid longer. It will happen, you have crossed the threshold! When I was first getting started I used hemi-sync and binaural beats. And I’ve tried the rope technique and others, but I no longer use any techniques. If you feel inspired or curious, try it! Also, how long does it take you to get into the vibration state from the second you lay down? And then how long until you project out and float out, from the second you lay down? I wish I had a good answer for you. I’m not sure why you are having trouble getting back into your body or leaving your body while your’e walking. The lack of control could be symbolic for a lack of control in your waking life. It also might be related to trauma or post traumatic stress. How many times were you entering out until you could OBE at will? I still can’t OBE at will, but when I feel the sensations, I’ve built up a habit that I can project out or relax into them to go OBE if I want to. I think it took a few months since I had my first accidental OBE to when I had my first one on purpose. Hey Helen, you are so close! The fear can be tricky, but the way AP works, it tends to reflect your inner state. So if you are feeling fear, you manifest scary things. And the more you fight it, the more they fight you. I know from experience, that if you relax and become the observer your reality shifts to reflect your inner state. Scary things can become puppies. Your enemies suddenly give you a hug, etc. Practice meditation to work on becoming the observer of your thoughts and feelings and this will become easier. Good luck to you! In all my experience and research, no it’s not possible to get stuck out there and never come back. In my opinion, what you see “out there” isn’t exactly the same as what you see in the “real world.” There are often subtle differences. It kinda depends on YOUR perception and level of conscious awareness. That’s pretty awesome. They call those “false awakenings” and are quite common in the lucid dreaming and OBE circles. It was definitely some altered state, out of body or otherwise, that’s not typical. So congrats! I just wanna give kudos to you Jeff. You replied almost all the comments since 2015. You are awesome man. Are you still having obes Jeff? If so, how often? Have you ever had an obe without the vibrational state. Just curious. Yeah sometimes, but not as much. And I’ve had OBEs without the vibrational state – at least a very subdued version of it. Sometimes I have a lucid dream or realize I’m out of body after I’m already out. I wake up very often during the night feeling like the bed is vibrating. I’ve read that this could actually be my body in a vibrational state, trying to have an OBE. Any thoughts? Yeah I think you’re right. It’s definitely in the ballpark! Don’t give in if you don’t feel ready for it. Only give in if you are in your power and are choosing to allow it to happen. There will come a time when you trust yourself enough to allow it to happen but that comes with experience. This is also a lesson for waking life! Thanks :) It’s a theme right now for sure. Mind if i chime in Carly? I believe you are still in the vibrational stage when you experience the ankle grabbing etc. Focus on ignoring any strange noises or scary things and relax to finish the actual projection where all those things disappear. During the vibrational stage all these types of bizzare things happen. There are no “real” evil entitys-only those that have been created by someones mind-or yours-and nothing has any power over you. You create your own reality. Hope this helps. Dying is only the key to a PERMANENT astral projection. Most people want the temporary kind.